Are you looking for ways to make your building more green and sustainable? If you are, you may be considering energy-efficient light bulbs, better insulation and a new Energy Star rated HVAC system, but don’t forget about your plumbing system. Leaky and outdated plumbing systems can waste water, increase your water bill and lead to numerous expensive repairs. According to the National Institute of Building Sciences, building sustainability involves striving to use less critical resources in the construction and operation of a building. Sustainable buildings are typically green buildings because they use less energy, land, raw materials and water over the course of their expected useful lives. These buildings also strive to reduce environmental damage by producing less waste and CO2 emissions. Green buildings typically use Energy Star and WaterSense rated appliances and fixtures, like HVAC systems, energy-efficient light bulbs and low flow toilets and shower heads. Sustainable buildings also contain green outdoor spaces and may have recycling programs. Some may even utilize solar panels or wind turbines to help reduce electricity consumption. When it comes to improving the sustainability of your building, there are several programs available to help existing buildings become green buildings, including LEED and Energy Star. Your plumbing system should be part of your building sustainability program. Freshwater is a natural resource that is limited. In fact, only about 2.5 percent of the Earth’s water is fresh water, according to USGS, and in order to provide your employees and residents with a safe comfortable environment, you have to be able to deliver clean water that is free of harmful contaminants, like hard metals, lime and pathogens. 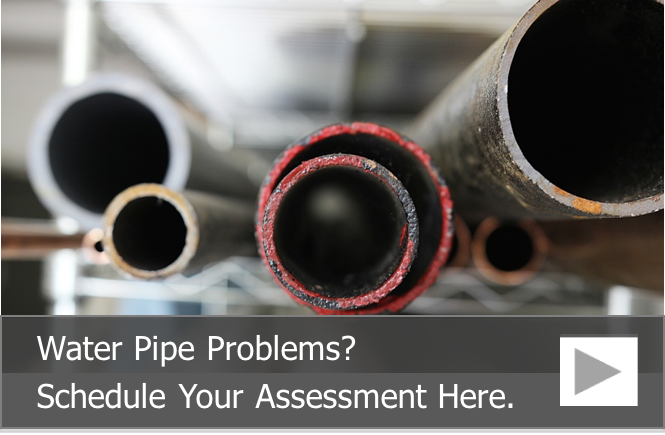 Unfortunately, your plumbing pipes can be a source of contaminants. As metal plumbing pipes age, they start to corrode. This can lead to a buildup of pathogens in the water, lime scale and hard metals, like lead. Metal plumbing pipes also do not last as long as plastic plumbing pipes. While PVC pipes can last up to 70 years as potable water pipes and indefinitely as drain pipes, metal plumbing pipes, like brass and galvanized steel, only last between 20 and 70 years. Copper pipes tend to last an average of 50 years but have been known to last an extremely long time under the right conditions. When it comes to choosing sustainable materials for your plumbing system, plastic pipes, like PVC, PEX and CPVC, may not make the top of your list, but you should consider plastic plumbing pipes as well as epoxy plumbing pipe restoration because they use fewer resources over their entire lifecycle. 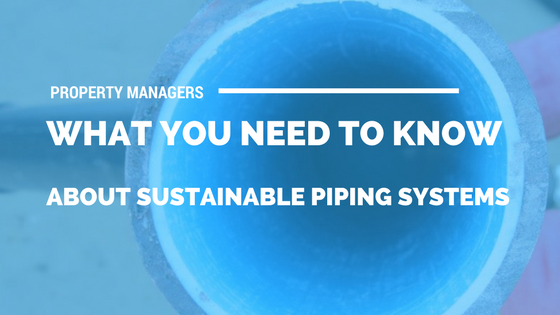 In fact, the Plastic Pipe Fittings Association (PPFA) recommends taking a long look at the plastic piping options that are on the market today because of their low lifecycle costs when compared to other plumbing pipe materials. Additional benefits of plastic piping include safety, durability, low resource and energy consumption during manufacturing and fast, easy installation that uses fewer manhours and less expensive machinery, tools and equipment. If you are looking for a way to advance your green building initiatives, lower your water consumption, reduce containments and extend the useful lives of your existing plumbing pipes, consider trenchless pipe lining from Nu Flow, serving Chicago. Epoxy resins have been rigorously tested as both stand-alone coatings as when used with pipe liners in order to ensure safety and reliability, and they can last as long as 50 years. Epoxy resins do not contribute to water contamination, and they can stop chemical leeching from metal water pipes by preventing water from coming into contact with the host pipe. Epoxy coatings and pipe liners also stop leaks, which can waste water and increase your water bills. To learn more about how trenchless pipe lining can help you achieve your green building initiatives, call us at 815-790-9000.